Approximately 2 years following her death, a bench in memory of Lauren Giddings was placed in Washington Park where Lauren usually enjoyed walking her dog and relaxing. Her family asked for a memorial bench to be placed in the park in honor of her. 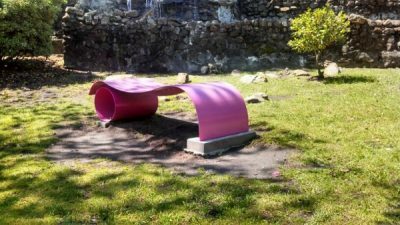 The bench is a bright pink, comprised of metal, and has a curvy retro design. Theme: Allman Brothers, Georgia, History Located next to H & H restaurant, this Library is inspired by Macon’s traditions, like great Southern Rock and soul food. Within sight of the Medical Center and St Joseph’s, this is a great Library to learn more about Macon’s history. 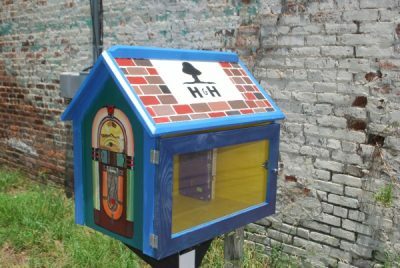 Theme: Mysteries and drama Located in the pocket park where Cherry, Spring and Magnolia Streets come together, this Little Free Library is inspired by Macon’s vibrant theater community. The Grand Opera House is only a couple blocks away, and Theater Macon is a bit further down Cherry. Maybe you can pick up a copy of Le Mis before going to see the performance July 11 – 19, or maybe James Patterson is more your style. 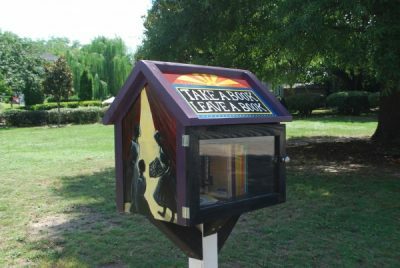 You’ll always find exciting stories and a perfect place to enjoy them in this quiet neighborhood park. The Poplar Street Yard in Macon, Georgia was part of an urban revitalization project by Artist and landscape designer Walter Hood, who is currently a professor of landscape architecture at the University of California Berkeley. 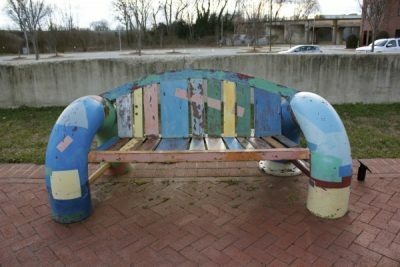 He is known for reconstructing ols spaces into newer, more modern public areas for the surrounding community. This work extends along Poplar street median from MLK Jr. Blvd. 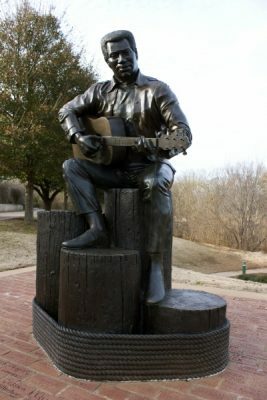 to 1st Street, through Hollingsworth, Prince and Addison Tinsley Parks. 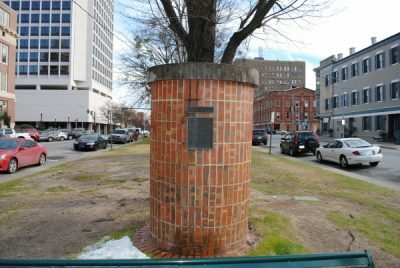 He took a 180-foot-wide street, with a square wedged in it and turned it into Macon Yards on Poplar Street, a landscape mash-up of street, park, and plaza. 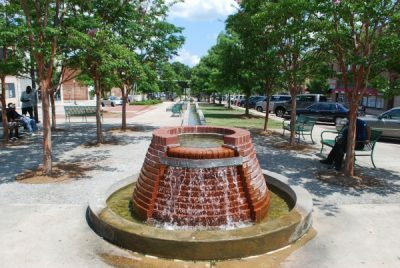 He took the 180-foot-wide street, with a square wedged in it, a “typical Southern typology,” and turned it into Macon Yards on Poplar Street, a landscape mash-up of street, park, and plaza. An obelisk from Confederate days in the center is now made the focal point of the landscape. The project for the re-making of Poplar Street in Macon, Georgia, utilizes the yard and the street as historical archives to bridge the gap between the past and present. The yard is a simple gesture that refocuses the street into small identifiable spaces where people come together to socialize or for other leisure activities. Current uses such as parking continue. They are juxtaposed with new building structures that sit atop previous building sites, water features that emanate from previous sources, spaces, and places where music can be played, and landscape elements and planting can create space. The new objects and spaces take on new meanings through human use and change in context. The yards are synonymous with the street. As you walk up and down the sidewalk you notice spatially that activities and movement are taking place in the street itself. The Poplar Street Yard in Macon, Georgia also represents Hood’s concept of conscious hybrid landscapes. He calls conscious landscapes deliberate “collisions of differing points of view,” which “fuse the un-fuseable.” He said the result of all this fusing is a “strangeness,” because there are multiple types of landscape brought together that perhaps don’t belong together. He thinks conscious hybrid landscapes are needed because they can fundamentally shock people into changing perceptions about what is an appropriate landscape. “By making things visible, we can better understand place, “Hood declares. The hybrid landscape consists of a street, park, and plaza. The 189 foot wide plazas are edged with diagonal parking spaces – making it easy for folks to meet up – and contain historic references, such as trellises created from old Quondet huts in the area, In one square, an obelisk commemorating the United Daughters of the Confederacy sits amid raised white cubes, picnic tables designed as abstractions of big bales of cotton. Like most of Hood’s designs, they’re subtle, but unmistakable. At the top of the hill, the obelisk dominates the yard where the water overflows into a big trough. The shadow and reflection make the yard seem full. At the bottom of the hill the fountains that channel along for a block begin to disappear.